It has long been an open secret in upstate New York that the dairy industry has been able to survive only by relying on undocumented immigrants for its work force. Now, this region has become a national focal point in the debate over President Trump’s crackdown on undocumented immigrants and their role in agriculture. The tensions have escalated to such a degree over the last year that Gov. Andrew M. Cuomo described federal agents as reckless, accusing Immigration and Customs Enforcement of violating the rights of farmers in pursuing undocumented immigrants. Mr. Cuomo was responding to a high-profile raid on a dairy farm, during which a farmer was briefly handcuffed after protesting that ICE agents were mistreating one of his workers. The farmer claimed ICE did not have a warrant to enter his farm. Mr. Cuomo is a Democrat, but Republicans who represent upstate New York in Congress have also come to the defense of the farmers. This year the labor shortage has been compounded by Mr. Trump’s trade war and extreme weather, forcing some small farmers to switch to higher-value crops, to reduce their acreage and to consider selling their farms. Supporters of stricter immigration policies said they were sympathetic to the plight of small farms. But they pointed out that the farms’ reliance on inexpensive, undocumented labor would handicap American agriculture in the long term. He plans to introduce legislation in the coming weeks that would offer temporary employment authorization to year-round farmworkers on dairies as a stopgap measure. 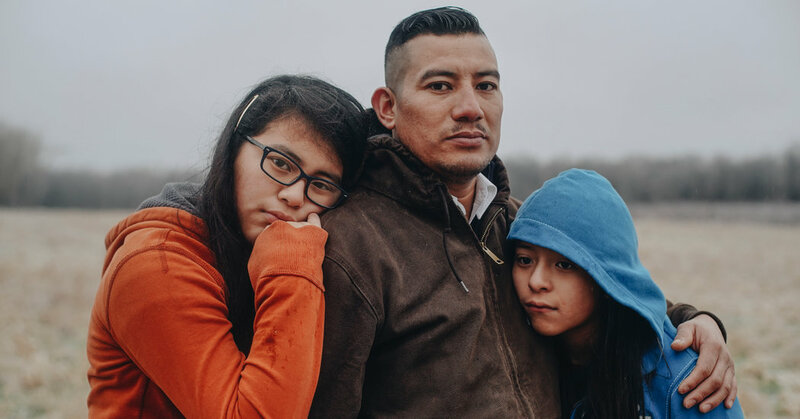 Deportations have been a concern for New York’s farmers and farm workers since the early 2000s, when the sudden enforcement of immigration laws led to a rash of immigration enforcement activities on farms across the state. After the Obama administration narrowed the pool of immigrants ICE prioritized for deportation, some sense of security returned to upstate farming communities, which was shattered when Mr. Trump took office. “We had heard things were starting to get bad, some wineries in the area and quite a few in the Finger Lakes started losing workers. It was almost immediately after Trump took office that ICE started snagging people,” said Kelly Raby, a vineyard owner in Lewiston. Over the last 50 years, American farms have relied on two labor forces: migrants who settled in the United States during the migration wave of the 1960s and 1970s; and those who stayed temporarily, illegally crossing the border for each harvest season. But today, permanent migrants who settled are reaching their 60s, fewer and fewer seasonal migrants are coming to the United States, and enforcement operations are driving the few migrants left out of the state. “Today you go to work and you don’t know if you’ll come back home and be with your family again,” said Eladio Beltran, an immigrant from Mexico who works in an apple orchard in Albion. He is currently awaiting deportation proceedings after being pulled over by state troopers and taken into ICE custody. “Being undocumented and living in New York State is not worth it anymore,” he said. For dairy farmers like Mr. McMahon, if even one of his migrant workers leaves, the absence has a drastic effect on his 2,300-acre farm operation. He depends on having enough workers for round-the-clock shifts, seven days a week. They keep this schedule year-round, he said, to ensure his roughly 800 cows are milked three times a day, their calves are fed, and all cows are medically cared for. “What we really want is some kind of method of getting foreign workers legally,” Mr. McMahon said from his farm in Homer, about 30 miles south of Syracuse. Owners of apple orchards and vineyards, who can afford to, have also started turning to the H-2A program, the legal foreign worker program that brings agricultural labor to the United States for temporary work. Critics of the program argue that workers are often exploited by employers and risk deportation if they complain about mistreatment. Farmers complain that it is costly, complicated and laden with bureaucracy. If the issue of undocumented farm workers is left unaddressed, there will be an impact across the supply chain. “There will be long-term consequences that not only our farms will deal with, but consumers will have to deal with as well,” said Steve Ammerman, the senior associate director of public policy at the New York Farm Bureau. Without a legal alternative to informal migrant labor, the competition between dairy farms to retain migrant workers is so fierce that farm owners, once notorious for underpaying and mistreating workers, are now improving working conditions and wages to entice employees to stay on their farms, workers said.